Follow us on Facebook and Twitter for Special Offers and the Latest News! Simply enter your search terms below and hit return to search. Simply enter your email address below and hit return to add yourself to our new mailing list. Click here to use this handy tool if you're unsure of any measurements found on our site. 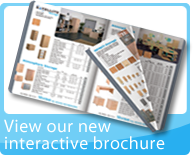 Click here to download our complete brochure. We offer CAD space planning to full turnkey solutions. We have a great range of used great value furniture.